An art journal page about Becoming…about using the gifts I have been given to become the person I would like to be, that I was meant to be, the highest version of myself. I was going to do this butterfly and flower head thing on a renaissance painting head, but then I realised I could just as easily use a photo of me and make it more personal. I remember “discovering” this photo of me, aged 34 when I was 50 and in a menopausal/post divorce depression. I couldn’t believe how happy and confident I looked. I kept staring at it. I’d forgotten I ever looked like that. I put it up on my fridge, to remind me that I was happy once. And will be again. 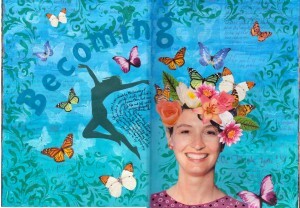 So I love that photo and now it stands in as an avatar of me in some of my art journal pages, it represents my spirit shining through, even as my body grows older. I offered this page as an idea to the students of The heroine’s Journey Part 2 course in their last week. I’m looking forward to seeing if some of them have made a similar page. In the background I used photocopies of comments written on cards I had been given in recent years, by choirs or by the Songbirds, where they had written kind things about me, thanking me for my gifts. I glued them down, gessoed over them lightly and then painted the aqua colour over the top.